Last week Old 97s played at The National. I could write a lot of words about how much fun they were, about how they are the “rockingest” and “bestest” bar band I’ve seen in ages, maybe ever. I could tell you how surprised I was that the show didn’t sell that well, about how I hadn’t planned on going until my friend Dana said she’d go to this venue for the first time so she could see this band. I could tell you how impressed I was with openers American Aquarium, especially when they played a slowed-down version of John Prine’s “Spanish Pipedream.” I could say that all those in attendance had a rip roaring, alcohol-fueled party for two uninterrupted hours. And I could tell you how sorry I was that you missed it. All of those words mean little when I have this video I could show you. Here is most of the Old 97s song “Stoned” that I recorded only because I knew videoing it would prevent me from screaming the lyrics to the point of losing my voice. So here’s the video. I’m very sorry you missed the party, but I’m glad Dana and I were there. Make sure you see them the next time they’re in town. Until then, pickup a copy of (or stream via Spotify) “Alive & Wired”, grab a bottle of something and throw your own party. As the clock read 6:30pm on my work PC tonight, it just sort of hit me that tonight is my last full shift at the office before moving to Work At Home Full Time on Monday. I am leaving work early on Thursday and Friday to attend shows. I was thinking last night, of the core group of original ‘Tier Two’ HelpDeskers (Beth, Tony, Chris C., Chris B., Sharon and Eric), I am the very last one to start working from home. My desk is pretty much cleaned out of the stuff that belongs to me. Since this desk used to belong to Beth, the Help Desk Mom, the desk has a medicine cabinet, plastic wear, mugs and enough markers to last years. Most of that is staying put. I am however taking the mini-mirror that belonged to Mark C., and then was ‘handed down’ to Beth, and then to me since I inherited the desk. I have already put my key in the desk lock for whomever lands here next, knowing full well they will have no idea or appreciation for the small trinkets that have adorned this cubicle since the eBiz Help Desk moved up to the third floor. All in all, I am very ready to begin the next chapter, and I look forward to the new challenge of working from home, though I know I am going to make myself go out more often after work, so as to avoid becoming a hermit who never leaves home. As my calendar proves, that’s never been my style. 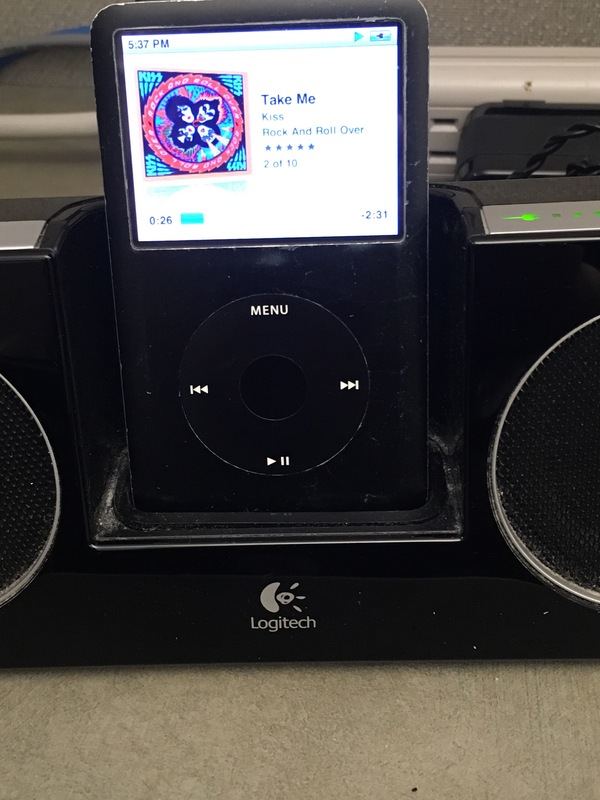 First, an update on my iPod: I want to sincerely thank you for the outpouring of support and commiserating that so many of you offered after hearing about the demise of my iPod Classic. I even had some friends toss around the idea of starting a Go Fund Me page to purchase a refurbished iPod. That was completely unexpected, and just proved once again what great friends I have. Even before I finished and posted the blog about the iPod, I had bid on a few iPods on eBay, and I won one of them; just like mine, but a generation newer, so it was a bit thinner and sleeker, but still held 160GB of memory. While I was waiting for that to be shipped, I still tried to ‘revive’ my iPod, usually trying to disengage the ‘Lock’ mode. Then, on Tuesday July 19, eight days after it locked up, the iPod suddenly responded and the lock icon was removed. I made the mistake of trying to revive the iPod right before bedtime, so now, instead of the expected failed attempt followed by going right to bed, I was now shocked and hyper at my success. I plugged the iPod into an outlet to let it charge up, and then stayed up far too late listening to songs with headphones, songs that were not available on Spotify (namely Rialto and Taylor Swift). A few days later, the iPod I purchased on eBay arrived, and I did a transfer of my entire library to that iPod. So, now I have two working iPods. I am certain that my original 2008 device is running on borrowed time and I am expecting it to crash/die any moment, but I’m glad I have a backup device at the ready, even if I don’t have to use it for a very long time. The second reason for this blog post is to announce that, very soon I will be a fulltime Work At Home (W@H for short) employee with Anthem. Since April I have been paying $20/day or $100/week to get to and from work. After getting some advice from my former boss, I went to HR in mid-July and, after a series of meetings, a medical exception was granted to allow me to work from home and still do all of my current duties. It wasn’t that long ago that almost any job at Anthem was able to be made a W@H position, every job except a call center agent. That’s changed recently, so that allowed me to even broach the subject with my boss and HR. I have said repeatedly since I began working at Anthem ten years ago that I would be a horrible W@H employee, because I would have too many distractions at home. But, as circumstances have changed, I am more than willing to prove my original assessment incorrect, especially if it saves me $100 a week! I am all at once excited and looking forward to the new challenge, and I am also kind of freaking out about the sea change. One of the drawbacks of working from home as a call center agent is, it’s an all or nothing deal; you either work in the office 100% of the time, or work from home 100% of the time. I know I’ll miss seeing coworkers at the office, but I won’t mind one bit being able to sleep about an hour later than I do now, so I’ll take that trade. Seriously?? I laughed so hard at that straight-faced statement that I had to pause the presentation and wait for the giggles to pass. Thanks to my former boss Frank for convincing me to go to HR with my situation and request, and thanks to HR Rep Susan and my current boss Jim for making it happen. I’ll be writing much more as my W@H date nears. I saw the new Woody Allen film, ‘Café Society’ this past weekend. I’ll say at the outset that it was far more enjoyable than the utter waste of celluloid that was his last picture, ‘An Irrational Man’, so that made me very happy. Is ‘Café Society’ as strong as his classics, or as strong as his most recent ‘great’ film, ‘Midnight in Paris’? No, it is not. It is however a very enjoyable period piece, somewhat reminiscent of 1987’s ‘Radio Days’. The cast is excellent, and the script is a great dose of the ‘comedic melancholia’ that Allen can do so well when he wants to. If you’re a fan of Allen, you’re going to see this movie. I don’t know if the movie will win any new converts, but it’s a good film; not great, but good. As I have said before, a good Woody Allen film is better than almost any other film out there. Lastly, the summer concert season rolls on in August! First up on August 9 (One week from today!!) 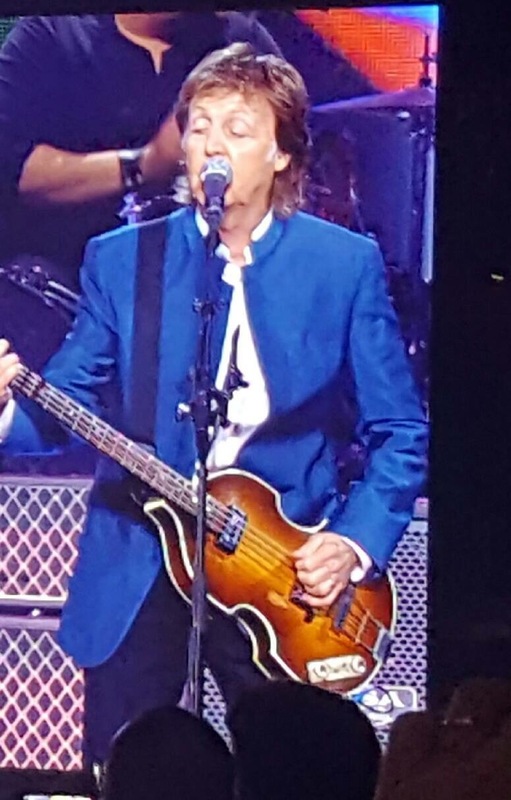 is McCartney in DC at Verizon Center. That promises to be a blast, even though the venue is probably my very least favorite indoor concert arena, and it makes me miss the old Cap Center each time I go there.